The journey from child to teenager is a roller coaster of hormonal fuelled changes. And the journey means there’s going to be some unwanted bumps and spots along the way. It’s possible to minimise and reduce acne with a systematic approach that doesn’t require drugs or harsh topical chemicals. WHAT CAUSES ACNE & CONGESTION? Our skin type is often inherited, which means the size and number of oil glands in the skin is determined by our genetic makeup. The levels of androgenic hormones (male hormones) in the body, controls the amount of sebum produced by the oil glands. When androgen levels increase, the skin responds by producing more sebum. Androgen levels fluctuate at different life stages with puberty and pregnancy being the two major stages in which these levels shift. Lifestyle factors such as stress can affect the activity of hormones, along with exposure to pollution (can clog pores), which can exacerbate the development of acne. Diets that are high in sugar have been associated with acne and some studies suggest dairy consumption can play a role in triggering acne and skin congestion. 2: Closed comedone (whitehead) or open (blackhead) develops. 3: Sebum continues to accumulate, oxidises and inflammation occurs (papule). 4: Inflammatory response in an oxygen deprived environment means that infection develops. 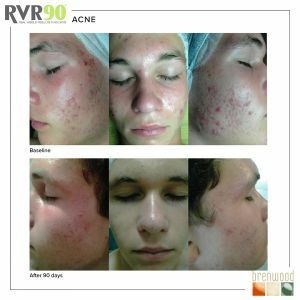 The nature of acne is complex so for best results, a targeted, multi-step approach should be taken, considering both internal and external factors. Our award-winning treatment program involves combining an effective at home program plus clinic treatments focussing clearing soothing inflamed skin. We also provide a skin tutorial to help your teen understand the nature of acne and how to best manage their skin. Understanding that acne needs time to resolve is essential and they need to be patient, consistent and committed. For most effective results and to help get on top of breakouts we recommend an initial course of six treatments every two weeks. A great first step on the road to treating your acne is to book a skin consultation to allow our qualified skin therapists to thoroughly examine your skin and decide on a customised action plan.